I’m not even halfway done with Eckhart Tolle’s book ‘New Earth’ and I’ve already signed up for his online course, called ‘uncourse’. Unlearning right? It is completely free and you go through the main concepts of his book(s) at your own pace. Here’s a screenshot of the topics. 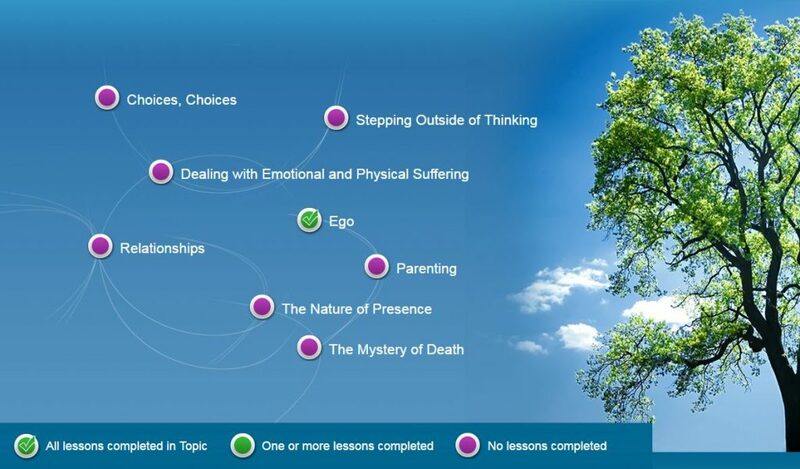 Each topic has 3 or more lessons inside them, and each lesson contains a lengthy video with Eckhart himself. As you complete the lessons you mark them as complete and on to the next one. I am trying to do one lesson a day. Of course I went for the ‘Ego’ topic first. Make a conscious choice to take responsibility for your state of consciousness in the moment. Stay alert to your state of consciousness to avoid creating additional suffering on the planet. What we do is secondary to how we do it; pay attention to your state of being while going about your daily activities. See if you can hold the space of non-resistance when your ego doesn’t like the situation it finds itself in. Allow appearances as it is without resisting. Accept the moment (condition) as it is. Right action can only rise out of right state of consciousness – Say yes to “what is” because it already is. Present moment: friend or enemy? It may seem like the forms the world take on may impede/ interfere on your freedom, like a traffic jam. We feel deeply trapped. Don’t resist the form of the present moment. For example if your body becomes ill. A form of present impeding on you. If you accept it before you think about how you will react, even if its dreadful and then spaciousness enters, peace rises. By accepting the form, the formless in you opens up.